Essential Emergency Food for Survival Kits. Emergency Food Supplies Don't Have to be Boring! World Famous Mountain House Food is Perfect for Flavorful Long Term Storage. Mountain House is the standard in freeze dried food supplies. These canned food supplies feature a wide variety of nutritional and delicious breakfast, lunch and dinner entrees that you can mix and match to suit you and your family’s taste. 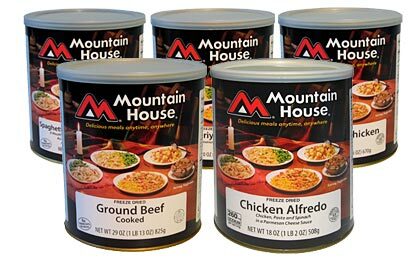 Mountain House freeze-dried foods are packed in airtight Nitrogen Packed #10 cans.